As winter was quickly approaching I realized we had not yet booked a trip to YurtSki. 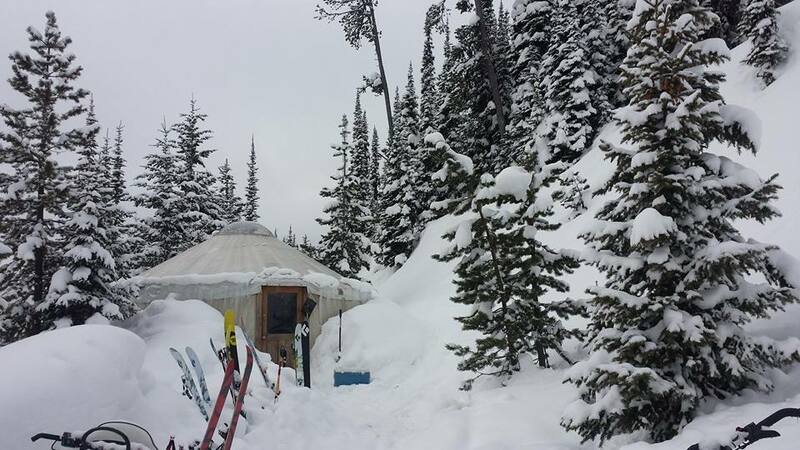 Following the 2013 trip most of us were focused on the much anticipated March trip to Williams Peak Yurt in the Sawtooth Mountains. However having not missed a trip to YurtSki in several years, it would not be right to miss this one. I found one of the last remaining weekend days available at YurtSki’s Lupine yurt and scheduled a Sunday through Tuesday. Of course I didn’t know then that timing was perfect for a big storm cycle after nearly a month of no snow. This brought along excitement mixed with anxiety. We often picked times later in the spring, opting for hopefully more stable snow conditions as we continue to gain experience. 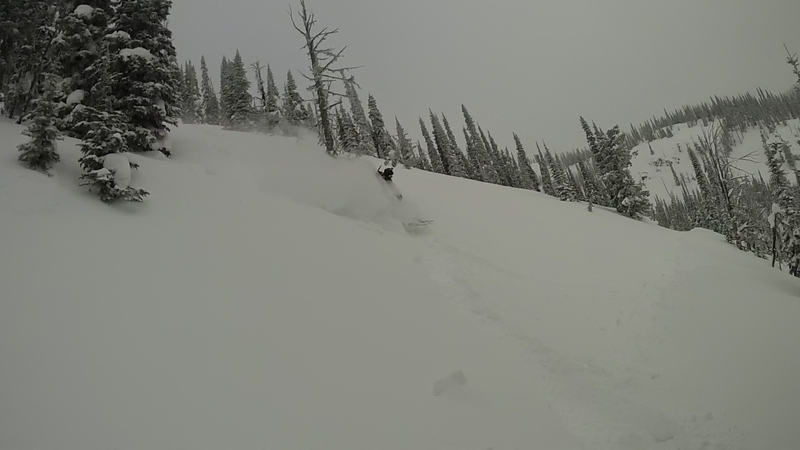 To say the least, the forecast had us anxious for what kind of conditions we would face. Over the next 3 days it would snow 2-plus feet combined with strong winds and low visibility. The trip into the yurt was uneventful, which for those of you who have been into YurtSki means none of the snowmobiles had issues, the tow sleds were packed well and we didn’t have to dig out the big drifts. This meant we would get in an afternoon run after unpacking at the Lupine Yurt. The skin track from the group before us allowed for a fairly quick ascent where we were able to check out a south facing ridge. After digging our first pit with decent stability results, we took off down what would be named Grouse Run, as Jim spooked up several grouse out of little “bomb holes” in the snow. We continued down the ridge and back to the yurt as strong winds continued out of the northwest. The next day we skinned above the yurt but continued on up towards the lookout. When we tried to work our way around the windy north side, we started to hear “whoomphing” and settling snow. This was quite unnerving and we chose a different route up the ridge, still having snow settle off to our left as we went up the mellower route. After concerns of finding our way safely off the ridge, we found ourselves above the yurt skin track in time to enjoy the beer in our packs since it was too cold to drink it up at the lookout. The snow was incredibly deep as we dug a pit to access the stability on the new slope. About a foot down was an incredibly intact buried surface hoar layer probably a centimeter thick. The flakes of the intricate crystals were still intact. While it gave us something to look at, it failed easily on multiple compression tests. 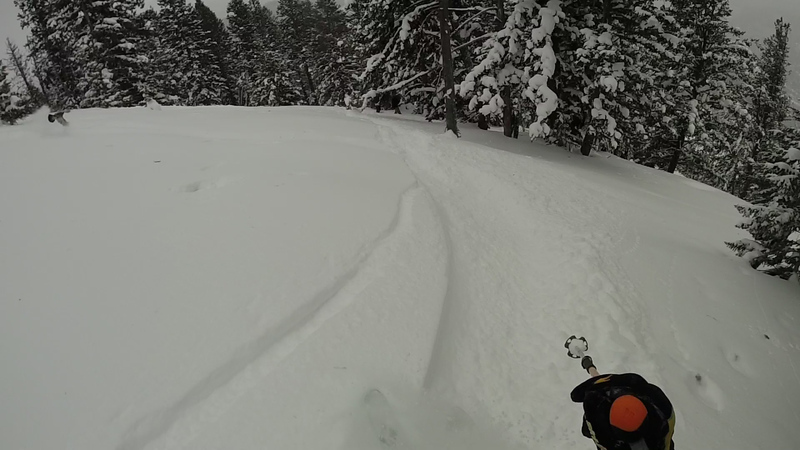 While the layer above wasn’t consolidated into what I’d call a slab, we decided it was just as easy to take a tree run farther to our left. At this point it was snowing and would continue throughout the night. The next morning we found ourselves on top of what we’re calling the Mink Run. I have not seen a mink in some time, however two of them were spotted on top of this run. Maybe they were showing us the deep powder lines. 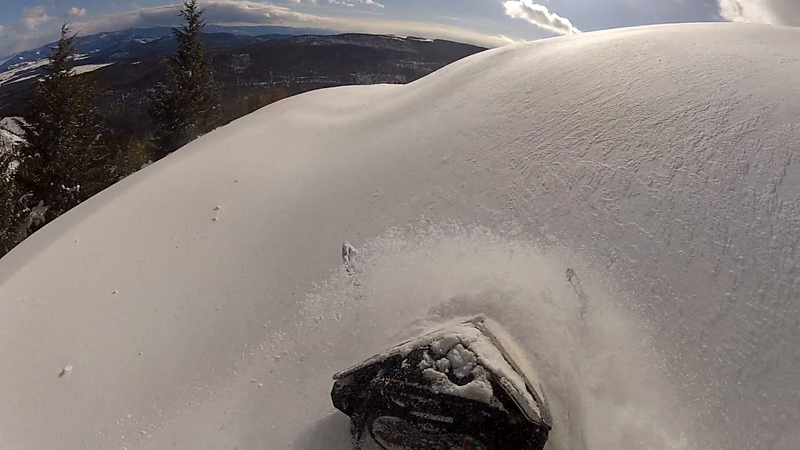 We had two good runs here in some of the deepest powder I’ve skied in the backcountry. Lots of yelling and smiles on Mink Run. We worked our way back to the yurt to start heading out as the sun came out for the first time since we’d been up there. Just turning the sleds around we realized it could be a chore just getting down off the mountain.